I bought it for Wii U tonight. After player for about an hour and a half, I've died five times, explored a ton of places, and I have no idea where I'm supposed to go next because the world is so massive. It's awesome. I've heard nothing but phenomenal praise for this game thus far. Need to pick it up for my godson very soon. Happy to see Nintendo come out with a winner, since Skyward Sword didn't seem to earn much acclaim (at least that was the impression these boards gave me). Skyward Sword wasn't received fairly coolly compared to most Zeldas, but I loved the game and found it delightful. Consensus is that the Sky is vastly inferior to Wind Waker's Great Sea, but the dungeons are fantastic. People are more split on the motion controls. I personally thought they worked very well and kind of miss them when I play Breath of the Wild. If you haven't played SS, Preng, it's definitely worth a play through, unless you hate motion controls conceptually like a lot of people seem to. I had a low opinion of Skyward Sword when it came out but I played through it again last year and enjoyed it more the second time. I also played through Twilight Princess again, which I used to have praise for but found incredibly dull and a slog to play through. So now I consider SS better than TP. I beat it this evening. It's a solid 7.5 or 8 out of 10. Fun game, but some serious mechanical blunders that hold it back from reaching its potential. I'll be curious to see where they take the franchise next. LordHuffnPuff, I'm curious what you find to be the serious mechanical blunders. As for myself, I shot a fox in the head for meat last night, and I've spent all day drowning in guilt and shame. Don't worry too much. The more foxes you kill, the less the shame bothers you. Things like rain being a giant middle finger due to the interaction with climbing and the weapon degradation system which precludes any sense of value or interest in any weapon you find. I would explain in depth why but I've done that too many times this week answering this same question in other places. Got it. I figured that's what you'd say, but I was curious. I understand the criticisms, and I think both of those things are good ideas that could have been implemented better. However, I'm a little surprised that those knocked it down all the way to a 7.5 for you. I've been absolutely loving this game myself. I've seen Excel talking about on AV Club a little bit (if you ever see Diet Kloster Wallace over there Excel, that's me), and it seems like he's been really enjoying it too. You ever pick this up, Preng? Yeah 7.5 or 8 felt right given that I don't even think this is the best Zelda so it can't be a 10 because the best Zelda isn't a 10, and two major issues taking off 1-1.5 points from there seems reasonable. 1.) What do you think is the best Zelda game? 2.) What game(s) do you think score(s) a ten? Games that deserve a ten... that's rough. A 10 is a perfect score, and I don't know if there are any perfect games. There are a lot of games that also were amazing in their time, but haven't aged well - do we score them as they were at launch or by modern standards? Do we give games that were wildly influential and popular, like Super Mario Bros., a 10 for their historical significance? Or is it just "what do you like best regardless of context?" This is by no means a complete list or what I'd pick if I were making a Museum Of Best Games, just some that I felt were influential on me personally as a person who makes video games, from either a design perspective or through the lens of emotional engagement. And there are games I didn't put on here but heavily considered, like Star Control 2 or Tetris. And what about non-digital games? So I don't know for sure how to really answer your question, hopefully this is good enough. I haven't picked this up yet, Lesh, and most likely won't until I have an opportunity to hang with my friend and godchild, since they have the Wii U. Soon, hopefully! I am tempted to buy a Switch but am waiting a bit to see how they flesh out the online capabilities, and also to see what other games come out in the next year. Finally purchased it for my godchild and I have made a very happy 8 year old. Got to watch him play it for about an hour. Very interesting to see in that time he had already acquired some magnet power, bombs, and was working on getting a paraglider. Cool that the game moves fast on giving you big tools. Also, in like thirty minutes he found fire and ice arrows. This is somewhat mind-boggling to me, since those were always late-game toys in Ocarina and Wind Waker. About to finish this one. Had a great time playing it. I didn't even have that much trouble with the gyroscopic puzzles as everyone else seems to complain about. Got all 120 shrines and only had to look up three; two to find out where the hell they were and one (2nd Kakariko shrine) how to trigger it. That new patch they released made it worse (at least on WiiU). The lagging is now less-pronounced but more frequent and the draw distance on items and NPCs shrank considerably. Oh well...doesn't negatively impact the game that much. Favorite part was the Survival Island shrine challenge. That and the Lynel fights. And finally learning to parry the Guardian lasers. And walking around on the outside of the flying Divine Beast as it soars around the landscape far below. What a great game. still haven't picked this up but I love the gameplay videos.... I'm tempted to buy it on wii u, but I'm trying to hold off and buy a switch with it. I can't believe the hours I've sunk into this game, yet I still haven't beaten it. I'm probably going to attack Ganon sometime this week, but I've just had so much fun running around exploring and finding hidden things that I still haven't gotten around to the final boss. I'm not sure what game I'll play next, but it will probably feel like a letdown. I stopped playing it recently after a about a month of playtime (not ingame), with around 110 Shrines that i finished, Ganon beaten of course and with the whole DLC finished (except for the very last Master Sword Trail). It's a super fun and rewarding experience and probably one of the best games i ever played, just addicting as hell. What i liked most was capturing the Sheikah Towers and overall just exploring the map finding new places/weapons/mini bosses etc. Weakpoint in my oppinion (if you want to split hair with such a great game) is the story/story telling. Link is basically a nobody with nearly no backstory, just a "guy" saving the day. Guess this time they took the title literally because Zelda is in the spotlight, basically all through-out the game. I would have liked if the had established Link more as the hero he is and had given him some cool and interesting backstory. The game as whole anyways, is really really good. 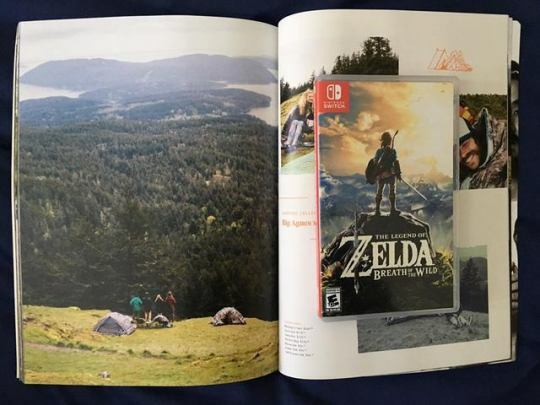 It's not a good Zelda game. What is a Zelda game? Is the NES Zelda a Zelda game? Is Ocarina of Time a Zelda game? BotW is a change in the formula, a formula that for many people (me not necessarily included) got old. like the dark and twisted nature of some NPC's and sidestorys or the presentation of the Lore that was reduced to just the Ganon-Link-Zelda-Triangle. It's not the perfect new Zelda game, but it is just so good that i wouldn't complain about it and it's a necessary step into the right direction for the franchise. If the developers take BotW as their ground to build on and take it a couple of steps further, BotW 2 (or what it will be called) will be the best Zelda game ever created.